Shimano's latest Front Drag Spinning Reel, the AX Series ULSA, is sure to be a fisherman's favorite. 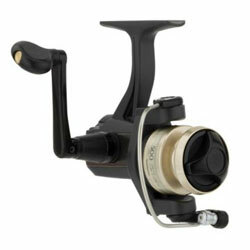 Shimano quality features include a graphite frame, graphite side plate, graphite rotor and diecast aluminum spool. This front drag spinning reel also features Dyna-Balance, which incorporates counter-balancing techniques in the rotor to eliminate wobble during the retrieve. Backed by the Shimano name, front drag spinning reel covers all the basics, performs well and offers plenty of enjoyment. "Not a bad reel for the price. Not the smoothest drag,but it's pretty dependable. I have had a few of these for nearly 10 years and they still function. In the end, it's still a Shimano and you can't go wrong with Shimano." "This reel is perfect for ultra lite fishing for bluegill. it casts light-weight lures." "I already had this AX series reel and bought the second one so that I could have two rods rigged with the same reel. I use this reel all the time with 1/8 oz. crank baits and 4# line. It's a nice as a light tackle reel."